France on Wednesday blocked a European Union statement calling on Khalifa Haftar to halt his eastern forces’ offensive in Libya, diplomatic sources said, in the latest example of how the bloc’s internal divisions have undercut its global sway. The draft statement, seen by Reuters, would have said that the military attack launched by Haftar on Tripoli was “endangering the civilian population, disrupting the political process and risks further escalation with serious consequences for Libya and the wider region, including the terrorist threat.” Thousands of residents fled on Wednesday as Haftar’s forces – called the Libyan National Army (LNA) – and troops loyal to the Tripoli government battled on the outskirts of Libya’s capital. France and Italy disagree on how to handle the latest escalation in the troubled north African country. 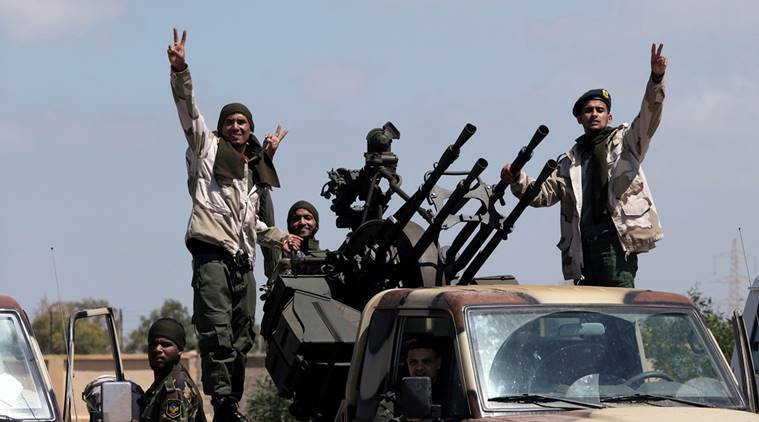 France, which has oil assets in eastern Libya, has provided military assistance in past years to Haftar in his eastern stronghold, Libyan and French officials say. Italy, the former colonial power and a big player in Libya’s oil sector, has supported the UN-backed Prime Minister Fayez al-Serraj. Speaking on the sidelines of an EU summit focused on Britain’s exit from the bloc, European Parliament head Antonio Tajani, who is Italian, said Paris and Rome had “diverging interests” in Libya. “We need more unity, we need to speak with only one voice as Europeans, but unfortunately Europeans are divided on this,” Tajani told reporters. France blocked the draft statement, which was drawn up in Brussels, through a process by which individual EU member governments could voice objections. The EU will now try to draw up a new text on which everyone can agree. EU foreign affairs chief Federica Mogherini said on Monday the bloc was united in calling for a truce and a return to diplomacy in Libya. The EU has supported al-Serraj’s government in recent years to have it crack down on refugees and migrants leaving for Europe from the shores of Libya. The country descended into a civil war after the ouster of Muammar Gaddafi in 2011, allowing people smugglers to operate with impunity. The EU draft statement would have said that “hostilities must cease immediately, the LNA must withdraw and the humanitarian truces called by the UN must be heeded.” The EU would also have asked “international and regional partners to exert their influence and send an unequivocal message to the aggressors that there is no military solution to the crisis, only a political one,” according to the draft. The French EU mission was not immediately available for comment.